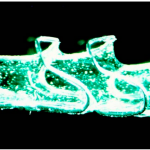 This article is about the Absorb Heart Stent, a new dissolving stent known as a Bio-absorbable Scaffold. Unlike traditional heart stents that remain for life, the Absorb heart stent dissolves over time to where it completely disappears. This has many advantages. 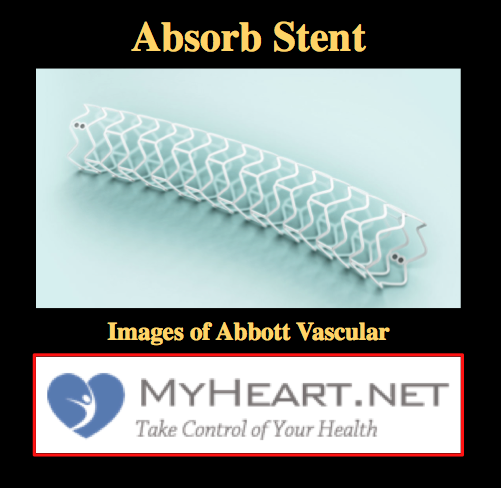 In this article myheart.net author, and cardiologist Mustafa Ahmed MD of Princeton Baptist Medical Center, Birmingham, Alabama explains the Absorb stent. Dr Ahmed was amongst the first to implant the commercially available Absorb stent in the US. Dr Ahmed implanted the stent in a patient of cardiologist Dr. Alain Bouchard with a Widowmaker heart blockage at Princeton Baptist Medical Center, Birmingham, Alabama. In this article we present information on the new stent, then we show the story of Mr. Richardson, a patient with the Widowmaker blockage treated with this Absorb dissolvable stent. At the end of the article is a link to the patient story. Heart stents are used to treat blockages in the coronary arteries that supply the heart with blood. A total blockage in a coronary artery would lead to a heart attack, and if not treated rapidly can lead to death of heart muscle. 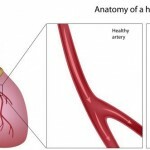 A significant blockage of an artery, usually greater than 70%, can lead to symptoms such as chest pain, shortness of breath and heart muscle damage. Heart stents can be used to treat these heart blockages and open up the artery, relieving the blockage and restoring normal blood supply. A heart stent is basically a small metal tube that is expanded inside the area of blockage. Once expanded it remains there and acts as a scaffold to keep the artery open. In the old days we used balloons to try and open the artery, but after the balloon was deflated the blockage would often recoil, meaning the chance of a successful procedure was not always good. With the development of heart stents, however, the scaffold from the stent prevented the recoil and meant the artery stayed open. Although the development of heart stents was a major breakthrough, the presence of these scaffolds within arteries was not entirely without problem. It’s important to remember that vessels are reactive in nature. They expand and constrict in response to various stimuli. 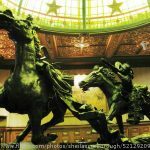 This is prevented by metallic heart stents. Vessels themselves are always undergoing changes and the presence of heart stents can disrupt this process known as remodeling. If further work is required in other parts of vessels downstream to the heart stents, the heart stents can get in the way. Metallic heart stents often mean that patients are required to take life long blood thinning medication. These are just some of the problems associated with heart stents, and therefore it was very exciting when absorbable stents were developed. The absorb stent is known as a bio-absorbable vascular scaffold (BVS) and is a huge breakthrough. The development of the Absorb stent meant that the stent could do its job, but then disappear over time leaving the vessel still open. For those wishing to dig a little deeper, the science underlying the Absorb heart stent is fascinating. It is made of a bio-absorbable polymer, which is broken down over time. 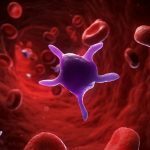 It also releases a drug that prevents early vessel blockages from forming. 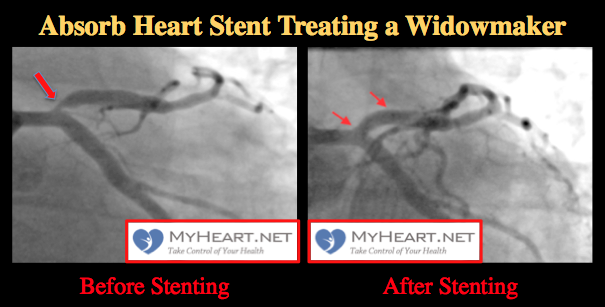 The stent has three stages before it disappears. These are revascularization, restoration and reabsorption. Revascularization is when the stent is initially placed and restores blood flow in the vessel. In the restoration phase the stent begins to degrade and the vessel regains some of its natural properties. In the reabsorption phase, the Absorb heart stent completely disappears leaving a natural vessel behind. The Absorb heart stent has been extensively studied with over 100,000 patients treated as part of trials or registries that have documented its usefulness and safety when used in the right patient population. Followup of up to 5 years has been demonstrated. Importantly, not only does the stent disappear, but also it is comparable in usefulness to existing stents. Some studies showed that if not placed correctly there can be a possibility of stent blockage early on with the Absorb heart stent. It is therefore important to pay attention to detail when placing the stent. The artery needs to be prepared properly and the blockage dilated with the use of good-sized balloons. The artery needs to be of a decent size; the stent is not effective in vessels that are too small. After the stent is placed it should typically be dilated with a balloon that is appropriately sized to the vessel and the stent. Following the suggested protocols can minimize the risk of early stent problems. 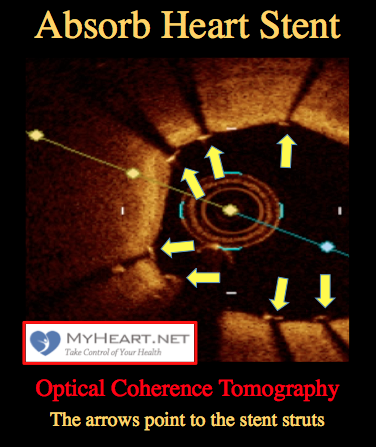 The Absorb heart stent can be visualized in the vessel using a technique known as optical coherence tomography. What is the best coronary stent for our patients? How long should I take my Plavix after stenting? i am From India day before yesterday my younger brother age 22 Having pain in chest when we went to see doctor they said 100% blockage in heart sir please help me what to do i am very tensed & so my whole family .!! he is very young please let guide us what to do . Can you provide more stairs so i can help you to understand the situation better. I was diagnosed with blockage 90% on my OM-1 on vessels on angiogram while a routine cardiological check up @ 50 yrs of age when there was a positive TMT.Me a non diabetic.non smoker,mild hypertension around 130/90.Can I be managed medically? I would have to see the films to comment accurately. Single vessel branch disease such as yours in many circumstances can be treated with medicine particularly if the medicine alleviates the symptoms. It also depends on the vessel size and the area felt to be at risk. Each case is different. I don`t have any symptoms in chest,neither i felt any discomfort till stage three of TMT where i felt cramps,can`t upload video/picture of angio.me started with,aspirin,clopidogrel,metoprolol and atrovastatin.can I wait for symptoms to appear before they do angioplasty? is it being used only in Princeton Baptist or available in medical centers all over States? Is this stent only being used at Princeton Baptist? I just had my second CTA of chest. Have mild stenosis in several places but, have severe stenosis secondary to non-calcific and calcific plaque in my LAD mid. What is standard treatment protocol? No chest pain. Not knowing the details of the case limits my perspective. However, most likely would recommend some form of stress testing next to determine the physiologic significance and the risk type of the lesion. I had a one time chest pain and severe. My left arm sometimes hurts and tingles. my rib cage after I eat and I purp after eating. Does this have something to do with my heart and need I be concerned? I also have leg pain in my left leg it feels like pins and needles. My cholesterol is 170 and everything else is normal. The symptoms appear to be atypical but a careful history and evaluation are still required then likely some form of stress testing. It may not at all be heart disease, but thats easier to say when there is evidence to rule it out. My father is 71 year old he is diabetic and hypertension patient. Last time he stop his bp tablets and his bp shoot to 225 and then we make his angiography so the result is 3 vessels are block. Its of course complex and not possible to answer a specific case without evaluating the patient fully. In most circumstances with this anatomy however surgery would be recommended. I have a total blockage of the right coronary artery very close to the heart. I’ve been told I’ve had it for a long time as it’s now being back filled via other means. My question is if this artery is for feeding the heart ,why is back filled doing anything as it still can’t enter the heart this way ? You have what is known as a chronic total occlusion of the right coronary artery. I suspect the arteries on the left side of the heart have grown extra branches that are going over to the right and in some way have taken over the job of supplying that area. In many cases this is surprisingly effective and adequate. If there are symptoms or a positive stress test, there are techniques for stenting the blocked artery, however they are reserved for symptomatic or those with a significant abnormality on stress test or impaired heart function. In many cases however, only medical treatment is advised. I am a 37 year old female & I had a medicated stent put in to correct an 80% LAD blockage in 07/2014, due to insurance issues & trouble securing a good PCP let alone a cardiologist I had a massive heart attack one month ago (4/6/2017). Was explained to me that the cause was not having blood thinning medicines. This time it’s was again LAD however this time it was 100% blocked (apparently the old stent is what became blocked) again it was corrected with another yet different medicated stent. This time I ended up with a good cardiologist & together we are making sure that insurance doesn’t fail me again with my much needed medications. Anyway my question is: Is it possible the stent or the healing process or the damage that was done can be felt afterwards? My cardiologist said NO when I asked if I would/could be able to feel it. However since the heart attack I have a slight tinge of pain under my left breast. It comes & goes, it only lasts long enough to be noticed then it’s gone. It is not a major pain or even really a big discomfort but it’s definitely something, I am curious as to what you may think is either causing it or what could have caused it continue. Any ideas are much appreciated. Pain may be due to a number of factors but if the vessel is entirely open and there is no significant disease elsewhere then the artery blockage is not likely related and it is reassuring that your cardiologist isn’t worried and that the described pain is what we call atypical. If similar symptoms to the ones where you had the heart attack reccur then you must seek immediate attention. Dear Dr. Ahmed, I’m a 52yr. old male with a stent(85%LAD) placed Jan.5 2015 after a MI on Dec.27, 2014. Also I got an ICD on Dec.21, 2015. After a failed nuclear stress test, my cardiologist wants to do an angiogram (cath.) on August15 next month. Should I ask about an absorbant stent or be ok with the other type? My EF is between 35and40%. Do I have any options better than another catherization? THANKS for your response!! I just found your website and videos, they are priceless and well appreciated!!! At this point the absorb stent cannot be recommended in general until further data is gathered. I would recommend the choice of stent be made by the procedural specialist depending on the lesion characteristics. Hopefully you don’t need one! Hi, Wonderful information, but scary too. I’ve had double bypass in 2012. Passes a nuclear test in 2015. All clear. How do I know when my past surgery has failed. Short of blocked arteries. Couldn’t do stents, 2 failed before bypass surgery. They covered over doctor said, main artery was 100% blocked, left artery 80%. Had 2 heart attacks before surgery. Please advise. Linette. In general need for surveillance testing is determined by symptoms. In some cases where patients has no symptoms at all prior to initial event there may be a case for more rigorous testing however. In general routine testing has not been found to be of benefit and is recommended once symptoms appear. I would however advise regular follow up with a heart specialist. Its difficult to comment without seeing the films. I suggest you have the cardiologist discuss with the surgeon and reconcile this matter. I just turned 68 on march 13th, I have always been in good health for the last 6 months I have been getting real weak after walking a short distance on march the 15th of this year my son took me the hospital emergency, I had 90 per cent blockage in two artery’s, had to have two stents put in, THANK GOD I GOT THERE IN TIME. I have normal Cholesterol levels and normal blood pressure. 5’9″, 160 lbs. Not on any medications except the new Lipitor 20 mg and baby aspirin started last week. Work should not be an issue long term. The cath should be performed if there are symptoms, however it would likely be equally appropriate to simply initiate medical management and see the response. Beta blocker and nitrate for example. Why were the tests done in the first place? As things stand, the drug coated metallic stents are the standard. More data is needed on the absorbable stents. Yes it can be opened using the right techniques and the right indications. I am 65 years old, female. I have one blocked heart vessel at 80%. The rest of my vessels are either just fine or minimally blocked. I am due for surgery for a stent. My problem is the blood thinners I will need to take. I have already had bad reactions to Plavix and Brillani (sp.?). Have there been any experiments in blood thinning maintenance after stenting with something other than pharmaceuticals such as fish oil, etc.? I do tolerate my daily aspirin well. Have there ever been any studies where just aspirin was used? What do they do with people who are not good candidates for blood thinners? What are the risks percentagewise of succumbing to an MI from an 80% blockage, say over the next 5 years? What are the risks with a stent but no follow up blood thinners? What, in your experience, is the best tolerated blood thinner? Is the blockage reversible with exercise and diet changes? Has it ever been noted? Regardless of which stent used, in general 6 months to a year of blood thinner would be recommended and in some emergency situations 1 month. Effient may be another option. This should be tried prior to any intervention. Good questions. In general, unless critical I would avoid stent placement in a patient who is not a candidate for blood thinner such as plavix, brilinta or effient. Im many patients i will trial them on one of these first to ensure they can tolerate it. To prevent acute stent issue its advised these are taken for 6-12 months, or 1-3 months minimum in some instances.